Why? Why now? And who might replace her? Just a few of the questions arising as a consequence of Kezia Dugdale's decision to step down as Scottish Labour leader. The truth is rarely pure and never simple, as Oscar Fingal O'Flaherty Wills Wilde reminded us. That is particularly so with regard to politics. Motives can be complex and many. But, to cut to the chase, do I believe that Ms Dugdale has been ousted in a coup by the left? No, I do not. Do I believe, nevertheless, that disquiet about her leadership among sections of the left has been an influential factor in her decision? Yes, I do. To recap a little, Kezia Dugdale was critical of Jeremy Corbyn when he first assumed the UK Labour leadership and when he faced a challenge for that post. As you will all recall, she was scarcely alone in that. However, she recanted when it appeared that: a) he was going nowhere; b) the party needed to unite; and c) his style and policies appeared to strike something of a chord with the dispossessed. Intriguingly, the muttering on the left about Ms Dugdale's own stewardship appeared, if anything, to have subsided to some degree. I stress, some. Someone who is in a position to know is adamant that there was no planned, structured manoeuvring against Ms Dugdale prior to her decision to resign. Most in the party, at least most in senior, elected positions, were rather enjoying the relative peace. However, that does not mean that she did not face continuing internal criticism. For example, consider the paper by the Campaign for Socialism which argued that the party's approach in Scotland had been wrong, that it had neglected the Corbynite offer of "for the many, not the few", concentrating instead upon attacking the Nationalists. Doing their sums, the CfS concluded that the Scottish strategy, under the control of Ms Dugdale, had cost the party seats. There remain those on the left who believe that campaign approach has left Ms Dugdale out of step with the approach of the UK leader. And that the mismatch required to be addressed, at some point. However, sources insist - again - that there was no direct or indirect coup mounted against the leader. Perhaps, instead, she simply took the prolonged hint. Image caption How did Kezia Dugdale's relationship with Jeremy Corbyn and his supporters affect her leadership? Always bear in mind the personal too. Kezia Dugdale has only been leader for two years. Only a short period, then - but a period of remarkable intensity. Ms Dugdale had a spell prior to leadership deputising for Jim Murphy at Holyrood, where he lacked a seat (she replaced him when he stood down). During that timescale, there have been four elections (two UK general, one Holyrood, one council) plus the European referendum. Just before that, there was the small matter of the Scottish independence referendum too: the poll which continues to define Scottish politics. So brief, but tough. Not quite Hobbes' "nasty, brutish and short" experience - but decidedly intense, notably vigorous. I believe Kezia Dugdale has been wearied to some extent by that experience - while stressing that she has enjoyed leadership. Until now. Still with the personal, a long-term relationship ended late last year (although she has since found a new partner) - and she lost her close friend Gordon Aikman to Motor Neurone Disease. Perhaps these events reminded her of the fragility of life, the need for balance. Then there is her character. She is passionate about her politics, but never zealous about her own role. Unlike others, she does not entirely define herself in relation to her own occupancy of office. She does not yearn constantly for personal preferment. So there are personal elements, significant personal elements. But always too there is politics. Kezia Dugdale was well aware of the discontent she engendered among sections of the left - although she disliked being regarded as other than left, stressing her own long-standing support for progressive taxation among other policies. Setting that aside, she knew that sections of the left would never forgive her for her earlier comments about Mr Corbyn. She knew too that some hoped she could be replaced - without necessarily agitating directly or consistently or effectively. Perhaps she expected them to come gunning for her at an earlier period. As noted above, that prospect appeared to have receded somewhat. But the disquiet was still there and undoubtedly added to her calculations and self-questioning. So where now? On the left, Neil Findlay has ruled out standing. Alex Rowley, Ms Dugdale's deputy, has accepted the role of interim leader. It is my understanding he will not seek to step up to the top job. If he sought the leadership, he would have to relinquish that interim role and shows no sign of doing so. Well-placed sources are backing Richard Leonard, an MSP with a strong trade union background. As to others, most point to Anas Sarwar who is thought to have done well with the health remit at Holyrood. Ms Dugdale? She says she wants to remain as an MSP. She will be loyal to the party at Holyrood, she says. And she will fully back Jeremy Corbyn, expecting him to become prime minister. But she is leader no more. 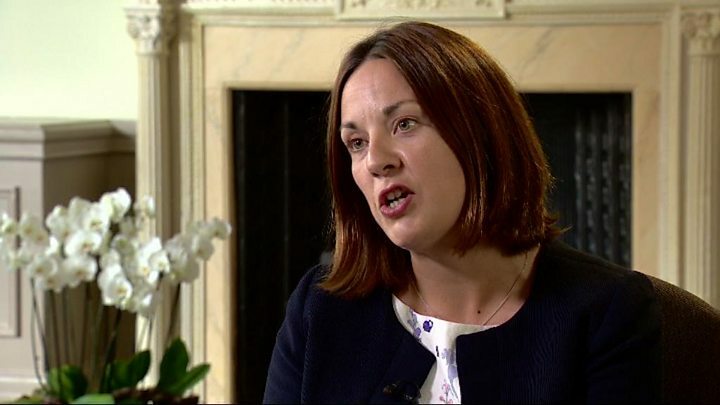 Scottish Labour leadership: Who might replace Kezia Dugdale?